Mondo heh. Perhaps a "what are you buying with your 'pathetic crumbs?'" campaign would serve the GOP. I think it's great but am concerned that the focus will be on short term bonuses and "trickle-down" (a term I could go a whole life without). The way more exciting thing to me is the repatriation from Apple. That, and better marginal expectations from investment, are the real benefits. Trump's economic growth "trickles-down" all right - like Niagara Falls. Judge Gorsuch is a HOSS of the highest degree. Thanks to Facebook Live®, I have had the CSPAN hearings on quite a bit this week. And he has performed admirably -- no, this calls for additional adverbs -- astonishingly admirably. He handles the hostile and stupid questions from the Democrats with cheer and seriousness. He handles the fawning GOP attempts with equanimity. I love his jurisprudence. I love his style. And I love that Colorado's Democratic back-bencher, Senator Michael Bennet, will face the excruciating choice to either buck his party or oppose an überqualified native son of the Centennial State. Mr. Whitehouse complained that Judge Gorsuch wouldn't recognize his "simple" point that money in politics is corruption. "I don't think this is simple stuff at all. I think this is hard stuff," the judge replied. Justice Thomas may soon have a new ally on the bench. Embedding disabled, but click to hear Chet Atkins play Autumn Leaves. Certifiably awesome! Our new, raw kidfo arrives. "An object lesson in needing to get servers to take you seriously," Cowen says between mouthfuls. I turn to politics. What does he look for in a candidate? "What I would like to vote for is a candidate that is socially liberal, a fiscal conservative, broadly libertarian with a small 'l' but sensible and pragmatic and with a chance of winning. That's more or less the empty set." -- Tyler Cowen in a very good FT interview. ...And were it not for lying weasels like Sen. Ted Kennedy this giant would have graced the Supreme Court. Robert Bork, who died today at the age of 85, was a former U.S. solicitor general, an antitrust scholar who taught (Bill Clinton, among others) at Yale, a judge on the U.S. Court of Appeals and an ardent foe of judicial activism. But he is best known for his failed nomination to the Supreme Court in 1987, which marked a turning point in our politics. "Borking" entered the Beltway lexicon. Political differences became an excuse for attacking someone's moral character. I encountered his "Tempting of America" when researching my Dred Scott Book. That project fizzled, but I enjoyed the background reading: particularly "Tempting." That book more than any other kindled my interest in the judicial branch's temperament, philosophy and history. In an afterward to the 1990 paperback edition, Judge Bork commends President George H.W. Bush on his recent appointment of David Souter to the High Court, which Judge Bork assumes will help end "over half a century of liberal policy-making by the judiciary." Who says Robert Bork wasn't an optimist? My opinion of Bork isn't as rosy since my first impression of him was, albeit media induced, as an activist religious zealot. Certainly not fair but the shades of gray are still in my memory. As for Justice Souter, perhaps some left-activist power broker has the capability of making him "go Petraeus." I will confess that our judicial philosophies diverged a couple times over the years. However, comma, that I have a philosophy to diverge from is a credit to his magisterial book. Larry Kudlow is in. I just caught Thursday's show last night (Yay TiVo and Yaayy Broncos!). It was not one to miss. Here is the Gov. Dean piece The Refugee quoted. Gotta raise taxes on everybody, not just the rich! Senator Rand Paul, who may have the best idea, told me in an interview this week that he's prepared to pin the tail on Obama's tax-and-spend donkey. "In the Senate," Paul said, "I'm happy not to filibuster it, and I will announce tonight on your show that I will work with Harry Reid to let him pass his big old tax hike, with a simple majority, if that's what Harry Reid wants, because then they will become the party of high taxes, and they can own it." Mister Mencken had it right: "Democracy is the theory that the common people know what they want, and deserve to get it good and hard." UPDATE: I left out that Kudlow repeated this to his guests on Friday in the spirit of endorsement. Elections have consequences, right H.L.? Yup, and I do NOT mean this in a millenarian, "when we're living like Mad Max instead of Mad Men, they'll see I was right, bwahahaha!" sense. If the Republicans "win" we'll muddle along slowly thanks to other Administration policies. If they "lose" we'll muddle more slowly and have a chance to fix it in 2014. It's not like a flat tax and 91% are the choices. Having listened to both this Rand Paul interview and the 30 second Huntsman blurb that drew adhominem below I'm struck by the contrast between direct yes or no answers to legislative questions in Rand's case versus sweeping generalities devoid of specifics from the governor. You're right that the range of compromise on the table is only shades of gray. What I think we also agree on is there is no political gain to be had by continuing to obstruct. Ten pounds of "extreme" for one pound, nay, one ounce of economic liberty. Were the prospects for compromise between the status quo or replacement of federal income taxes with a national sales tax we should all tie our bodies to the tracks. Moreover, the principle over which Republicans obstruct is far bigger than the proposed rate hike. We may even suggest that the Democrats pass their one-party soak-the-rich tax at a much much higher rate. It must be done very publicly though, with great fanfare: "The nation has elected Democrats who wish to take more money from those whose success is greatest. If this is such a good idea, why are they so timid about it? If they are in the right to take 39% then why not 49? 59? Mister President, where are your balls?" I'm afraid this strategy makes me nervous. As included in a discussion below regarding the ideas of Marx, irrational people are incapable of connecting consequences to the IDEAS which caused them. So why should we expect people to connect the continued economic malaise to the polices of the Obama administration policies they voted for. "Clearly no matter how much we soak-the-rich, it was insufficient if things didn't improve." That is a concern and a highly plausible outcome, dagny. That is why I want it to pass without a GOP vote. It is important in this strategy, as Larry Kudlow says to "pin the tail on the Democrats." I like this in the context of the other alternatives. We lost and cannot exert our will. The President and Senate Majority Leader are both ideologues who want to punish the rich more than they want growth or prosperity (feel free to rephrase that a little less harshly, but they are pretty devoted). The other very real alternative is to play brinksmanship right through, drive the economy into recession, get little or no spending cuts -- and then still be blamed for the bad economy but somewhat legitimately. I'm pretty sure that my post "Straight Outta Rand" was not quite in line with the Three Sources style book; I am not even sure how many of the brethern and sistern had any idea of the parody's original reference. jk - yes, I noted that too; that's the answer of someone who knows his every word is being scrutinized from now 'til the Iowa Caucus 2016...see the nice thing is that Paul Ryan can just say that as a Catholic he accepts that there is no conflict; the Church hasn't insisted on a literal interpretation of Genesis since sometime before Darwin boarded the Beagle. He said that he is “not sure” we will ever be able to fully answer the question of how old our planet is. Heh heh. Heh heh. He like, "doesn't know." The correct answer to the question, Mr. Rubio, is "Older than you and I are. Next question?" "I'm not a scientist" was both a good and bad answer. It can be construed as anti-science. Like PJ's Bryan Preston who said, "Too many of us believe that science is the enemy, too, which can lead to incuriousity" such positions are ossifying. Republicans must never consider science the "enemy." Modern science has been co-opted by actual enemies: Subjectivism, egalitarianism, and yes, altruism. All are misusing the authority of science in the name of statism. Very frustrating that he was asked. Dems never. All the same I'm displeased with the answer. It seems neither religious enough nor scientific enough. The freedom opening is good, but your answer is better. I'm also reluctant to place so much hope upon a single possible candidate for a race that is 4 years away. There are other good choices. I like him, but he is in no way on the top of my list. Yet another benefit to Liberty on the Rocks: I actually have some Facebook friends who are not economically illiterate. Interesting chatter about Gov. Chris Christie (Very Large HOSS - NJ)'s admonition against price gouging. Brother Bryan and a cohort of Liberty on the Rocks-ers were educating some folks. You'll be pleased to hear that I stayed out, except to recommend Russ Roberts's awesome The Price of Everything. On October 27, as East Coast residents prepared for Hurricane Sandy, New Jersey Governor Chris Christie threatened "price gougers" with stiff penalties. As David Brown pointed out in Mises Daily on August 17, 2004, shortly after Hurricane Charley hit Florida, foul weather is when we need market prices the most. Capitalism needs more foul-weather friends, not fair-weather friends like Christie. The piece is titled "Price Gouging Saves Lives in a Hurricane." Why does Governor Christie want to kill people? Reports today chronicle altercations in the long gasoline lines in areas affected by hurricane Sandy. Not mentioned in the linked article but on a Fox News broadcast this morning, disputes typically arise when a customer attempts to "cut in line." There are lots of reasons why one might want or need to get gasoline without waiting for 2-plus hours. Unfortunately, Governor Christie and the "price gouging" police prevent the market solution to this problem with their iron boot of "fairness." In a free market, retailers could establish different prices at different pumps where the more expensive pumps would naturally (and sustainably) have shorter lines. Choose your wait time as a trade-off with cost. What could be more FAIR? Nicely done. I took the liberty of adding this -- with attribution of course -- to Bryan's thread on Facebook. You guys are kidding right? If you follow jg's suggestion, rich people will have gas and poor people won't. The, "fair," way to decide who gets gas is to double the price for all and use the extra money to hire a, "gas procurement czar," who will decide who, "needs," the fuel the most. H.L. Mencken would remind us that Christie, and also my county executive, may believe what is true but ultimately are politicians, and will thus will say what is most politically expedient. I was thinking about a proper theme song for Election Night, and it came to me! I know these guys have been a huge success for over 35 years and Brian Johnson did a fine job, but for me the only Real Thing was the few dazzling years when Bon Scott brought his inimitable writing and style. Play it on Nov. 6 and raise a glass to the man. "Skål", brother! Kept in the proper perspective, it couldn't hurt to be prepared in advance with a playlist. Wherein even a fool in love eventually sees the light. The hubris is getting a little out of hand. But I'd have this handy. Playlist ready! Set your iPhone or other device to STUN! Blog buddy sc sends a link to the Allman Brothers' Whipping Post. Good! That one fits my feeling of the last four years. Here's hoping we may play the other songs instead, and your classic rejoinder is a must-play in that case. Kudos for linking the original artist. Toward that end, one more addition. Not the original, this is an excellent cover of a well traveled Bob Seger tune, but the photo montage is a must-see. Did I mention Secretary Rice's Speech? I have watched Secretary of State Condoleezza Rice's speech three times now. I fear one more trip to YouTube might result in a restraining order. But it struck me what the quintessence of the speech was. Of course, it was a superb and heartfelt speech, artfully delivered. If you can avoid corneal hydration during "the little girl from segregated Birmingham..." part you are broken. Beyond even that, though, it occurred that Condi is the bridge from the Old GOP to the new. She represents the best of what President George W Bush (43) left us. The Sharanskyite appeals to the universal appreciation for liberty, American Exceptionalism -- American Greatness. I harbor less antipathy toward our previous nominee than some around these parts, but Senator McCain's address was awful. He was preaching bellicosity to an auditorium of war weary Republicans to just-barely-polite applause. Rice was Reaganesque about American leadership without conjuring up mental images of Abu Ghraib and Karzai corruption. I don't want to go back to No Child Left Behind, President Bush, Rep. Tom Delay, and Speaker Hastert, but the party did not begin in 2010. Rice bridges the best of both. The party of Lincoln. Leo Fender would have been 103 today! Is This The Pose of a Free Man? Economic Freedom or Economic Dependency? Another good Atlas Shrugged vid. This one with Congressman Allen West. Ten minutes long, it includes very good short answers to questions like "How did Atlas Shrugged inspire you" and "Do you see any change in the American culture back towards individualism?" He even uses the ladder to prosperity analogy I use to explain how minimum wage and equal pay laws hurt workers instead of help them. Awesome. Rep. West is always visible for his "firebrand" comments. Great to see his more reflective side. Chris Christie is not a wimp, a hippie, or a countercultural icon. He's not known for taking time out from budget negotiations to smoke dope, or for his sympathy for drug dealers. Today the world, tomorrow ThreeSources! I'd like to show evidence of hypocrisy on Cristie's part, or at least a flip-flop, but I can't lay my hands on the article I remember reading last week saying Cristie wasn't likely to sign NJ bills to legalize pot and gay marriage. At least that is my recollection. It would seem that this mandatory drug treatment bill is a compromise he thought he could not be seen refusing. For my part I'm glad to see this. The GOP must make a hard sell for the kiddie vote and Cristie is influential enough in the party to drag other opinion makers along with him, at least to a degree. Grizzled old TEA Partiers like me can approve on the basis of reduced goverment spending for fighting the so-called drug war. I all but wept. One of the great Hosses of all time hit it out of the park on Kudlow last night (Joe Kernen guest hosting). Rodgers's bit starts at 4:50 if you don't have 10:46. I agree with every word and don't think I have heard it said better. The whole concept that somehow people are dragging the economy is wrong, People are the economy. The intelligence and wealth they create is what creates the jobs. Rodgers also criticized the increasing militarization of the border, alluding to a famous Ronald Reagan speech. To me, that makes the country look weak. What made the Soviet Union look weak? "Gorbachev, tear down this wall." When a country is so screwed up it has to put a wall between itself and its neighbor, that puts weakness on the other side of the fence. 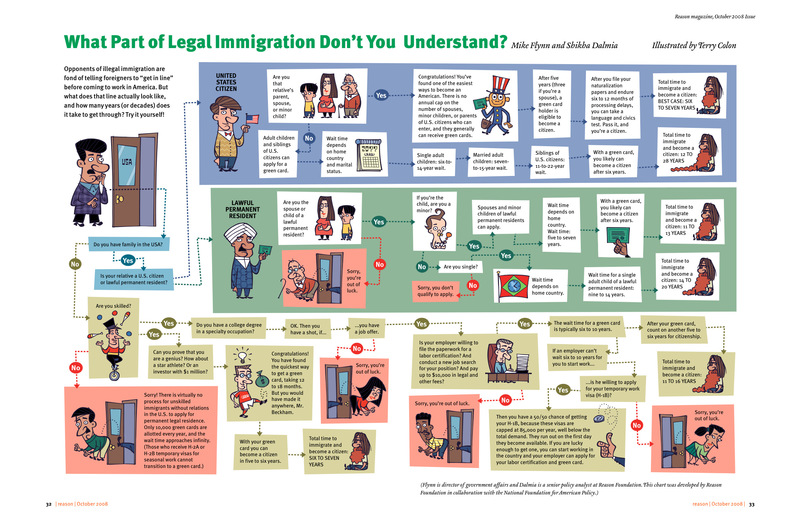 UPDATE: And Reason reprises their superb What part of legal immigration don't you understand? As the two intellectual forces of both Ron Paul and South Park have attested, a militarized border can easily impede in either direction. Produce rots in the field when farmers are forced to try and hire away software developers to pick it. It's not about whether Rodgers's Lexus will have heated seats. The most important and to me unassailable point is that people are the economy, and those who would shrink it in an effort to make us wealthier show no more sense than those who would bring prosperity by increased taxes, spending or currency creation. I also give him props for being "embarrassed for Republicans" on this. Rodgers is a strong voice for liberty; bully for him for not giving the GOP a pass. Perhaps you're right and we do disagree. BUT, I think I have been mistakenly put in the camp of those in the GOP that he's embarrassed by because I do want a strong border. It's assumed that I, perhaps Tancredo like, want no immigrants and that's a mistaken assumption. I think the border should be much, much more open and especially to those who perhaps have little technical skill, but are happy to work hard. You have to have control of the border and you need a liberalized immigration policy. Rubio is right that politicians like to keep the issue unresolved because it keeps an underclass of people picking their lettuce without really having to acknowledge that there is an underclass with a stamp of approval by the rest of us. Terri, the border thing works both ways. His point is that we can still defend our borders from invasion, but we don't have to actively keep people from coming in. In a great eulogy, Pericles mentioned that Athenians not only welcome strangers, but they don't try to hide secrets. They also didn't have massive social welfare that lured freeloaders -- THAT is the real issue that these conservatives need to talk about. The free market IS with the free movement of labor. The free market is far from the typical rubbish Republicans claim it is: there is no difference between someone immigrating from Mexico to work in the U.S., or someone from Oklahoma during the Depression going to California. The free market is simply the absence of force (whether applied to supply, demand or both), and government is entirely force. But legalizing the illegals is still not a free market. Actually, it brings in more government interference. The first unavoidable deleterious effect is that the turned-legal will be able to demand minimum wages, if anything to compensate for the income and FICA taxes they'll start paying. But at the same time, going back to my point about the massive welfare state, the bulk of Hispanic immigrants are lower-skilled and will qualify for EIC. There's a very real potential for some to become like too many Americans, getting more in refunds than they pay in. I would much rather keep things the way they are, and not have the federal government further drive up wages and prices. I am heartened, though, that someone is willing to say on a national program that Obama is just playing election year politics. So of the 9% of the electorate who are Hispanic, Obama won 6% in 2008. This race is tight enough that he needs the others, and a poll this week showed 90% of "likely" Hispanic voters favoring him. It was also a great point that for his time in the Senate, Obama did nothing on immigration, so why now? I would love an acolyte to say that, well, he was there just four years. It would validate the criticism about a freshman senator ex-"community organizer" thinking that qualifies him to govern 310 million people. It's a point of logic liberals can't escape: he did nothing then and is pandering now, or he wasn't a senator for very long to do anything. I was not familiar with TJ Rodgers, but after this clip, I like him. I will take issue with something: "like the Italians and the Irish before them who came and built this country," huh. Boy, if that doesn't ignore the two centuries before them. This is an issue for me because I once knew a couple of Italian-Americans who probably still declare that the shoe-shiners and cooks were "the ones who built this country." What about my German ancestors who came after the Irish but before the big wave of Italians? Actually, the ones who built this country into what we know today were Carnegie, JP Morgan, Vanderbilt and other industrialists. Shoemaking and cooking aren't what produce great advances in a civilization. It's great inventions that allow us to make better shoes and produce better food faster. Now who is the jackass on the right? I don't recognize him, but I immediately detest him for the idiocy of saying he favors immigration, just not the illegal kind. What does that statist want? What if the law merely says "legal" status comes after someone hops on a foot ten times? That's the very problem with using statute to define "legal": it can be changed at any time to be whatever the powerful want. @Perry: TJ Rodgers was the founder of Cypress Semiconductors, a reliable and brilliant advocate of free markets, and your friend Don Luskin's choice to be the reification of Francisco d'Anconia in his "I Am John Galt." The jackass is Mark Simone. There is some law at CNBC now that when somebody guest hosts for Kudlow, there must be a talk show host to co-pilot. I was heartened that only he took up the populist position. I feel as if I am swimming upstream on immigration and was happy to see the nativist in the minority. I think his point about Italians and Irish tracks right out of Michael Barone's superb book The New Americans. The German and British immigrants were certain that the Irish and Italian wave was unlikely to assimilate and that these new ethnicities lacked the Calvinist work ethic and were totally unsuitable to be Americans. Yet a few of them made good, and the Mexican and Central American wave likely will too. T.J. Rodgers on "The Buffett Rule:"
Buffet Rule "is bad, wrong and immoral. Somebody has to say that." The key point here is that PE firms virtually never buy jewels -- happy, fast-growing companies with glistening profits. After all, such companies have access to other kinds of capital; they don't need private equity. And frankly, private equity is generally not in the business of polishing things up for a low-multiple return. It's in the business of reinvention and rebirth, with fireworks at the end. WINSTON-SALEM, N.C. -- Doc Watson, the Grammy-award winning folk musician whose lightning-fast style of flatpicking influenced guitarists around the world for more than a half-century, died Tuesday at a hospital in Winston-Salem, according to a hospital spokeswoman and his management company. He was 89. Hmmm. What? Am I missing an inside joke? Lefty Democrat Mayor Cory Booker actually saved a woman from a burning building. On April 12, 2012, Booker saved a woman from a house fire, suffering smoke inhalation and second degree burns on his hands in the process. Newark Fire Chief John Centanni said that Booker's actions possibly saved the woman's life. Booker made news when on December 31, 2010, a constituent used Twitter to ask the mayor to send someone to her father's house to shovel his driveway because her father, who was 65 years old, was going to attempt to do it himself. Booker responded by tweeting; "I will do it myself; where does he live?" Other people volunteered, including one person who offered his help on Twitter, and 20 minutes later Booker and some volunteers showed up and shoveled the man's driveway. What a great bit of fun from two heroes of their respective philosophies and two savvy Garden state pols. I dislike the man's economics, but he gets a "HOSS" for his songwriting. Hat-tip: Biological brother via email. Wow. This could really tarnish his image if it went viral. Imagine that guy rolling a fatty. In the darker days of my adolescence, I spent a summer where I could do nothing but go to the Aladdin theater on East Colfax, buy a ticket to see "The Last Waltz," and watch it three or four times. I look back with sadness & bemusement at a lost summer, but I kept a special attachment to The Band: most notably the vocal prowess of Rick Danko and Levon Helm. Both of whom we've now lost. Levon Helm, singer and drummer for the Band, died Thursday in New York of throat cancer. He was 71. "He passed away peacefully at 1:30 this afternoon surrounded by his friends and bandmates," Helm's longtime guitarist Larry Campbell tells Rolling Stone. "All his friends were there, and it seemed like Levon was waiting for them. Ten minutes after they left, we sat there and he just faded away. He did it with dignity. It was even two days ago they thought it would happen within hours, but he held on. It seems like he was Levon up to the end, doing it the way he wanted to do it. He loved us, we loved him." D'ja catch this yesterday -- PJ O'Rourke pursues the squire's life in New Hampshire and gets -- a superb column out of it. This one feels like a punch in the gut. I don't know what to say right now except, what a huge loss. And Jonah Goldberg is better. I think our loss of him is magnified because he was one of the conservatives who could match the left in "hipness." An eerie personal anecdote: Last night I watched Atlas Shrugged Part 1 again with my in-laws, Mr. and Mrs. Macho Duck. During the scene of Lillian's anniversary party I pointed out Andrew in his cameo appearance as one of the partier extras. About that time he was fighting for his life in a California hospital. Andrew was an inspiration. Always happy to argue with a leftist, even when he had to pick the fight himself. I'll never forget him. I love the intellectual argument. Philosophy. Quiet. Meet your enemies halfway. Andrew Breitbart's considerable energies and gifts ran in a different direction. His penchant for confrontation qua confrontation made me nervous at times. But Jeeburz, nobody did it better. He may have been loud but did you even notice that he always seemed to be right? I met Andrew Breitbart in 2005 when I was asked to write for the Huffingtpon Post. He was running the show. Everyone who knew him -- left and right -- said he was brilliant, eccentric, one of a kind. I instantly fell in love with the guy. To this day, i've never met anyone as fearless. He was my first guest on Redeye, a show I got largely because he told people about me. He became a cheerleader for my work, but more important, a dear close friend I could confide in, about anything. My wife called him the wizard, for he could conjure up anything at any time with limitless energy. He's the only person I know who operated without a safety net. He always knew things would turn out the way they were supposed to - so he didn't worry about money or, i guess, his health, too much. He was the spiritual leader of the modern conservative, libertarian cause. He was immersed in pop culture and wished to drag the right into the modern world -- knowing this is how America speaks to the world. He was the heart of the matter. The fighter. Losing him is like a fiery planet going dark. My heart felt condolences go out to Susie and the kids. Hat-tip: Blog friend hb via email. He just said "HOSS" too. You can say Hoss too, or Hoss 2, but I say Hoss (superscipt)2. Amen. It reminded me of a Governor Romney speech. There was a mictrophone, a dias, and he used words. What is the downside of having an endorsement/supporter who makes you look insignificant? Is it just me or is our buddy Chris growing more portly? P.S. I didn't mean that as a cheap shot. The good folks at @Epiphone and @GibsonGuitarsPR salute The Band's Rick Danko. I saw him live with Paul Butterfield at the old DU arena; I bought the solo album he is working on in one scene of "Last Waltz;" and I'd stop to hear the little background vocs he added to Clapton's "No Reason to Cry" album. I lifted this video from the Epiphone page. If you don't want the (odd) bass lessons, skip to 1:50 for a sweet little blues jam. In peace, brother Rick, in Peace. Lenore Skenazy has appeared frequently on John Stossel's show and I have long appreciated her writing. She has a superb year-end piece in the WSJ Ed Page today on the difference between an isolated incident and a trend. This collective decision not to distinguish between rare screw-ups and systemic dangers is turning us into neurotic Nellies who worry about, warn against and, finally, outlaw very safe things. My favorite recall from the Consumer Product Safety Commission a few years back concerned a chair that had a screw protruding from the underside. While the commission reported that there had been "no reports of injuries to humans," there had been "one report of a dog's fur becoming entangled in the screw." Call my lawyer! When a twisted tuft is enough to prompt a 20,000-chair recall, that's setting the safety bar pretty high. Ms. Skenazy is raising her son, not only to have the delightful sobriquet "Izzy Skenazy" but also to be a confident young man who can walk around his neighborhood and ride the subway by himself. The whole article is excellent. The Velvet Revolution's Vaclav Havel has died. I celebrated Christopher Hitchens for his gift of spreading ideas. Havel turned ideas (and in my opinion less than-stellar rock and roll) into freedom for . . . how many? We can't count. Nick Gillespie and Matt Welch like to credit Havel with the fall of the Soviet Union. I'd give equal billing to President Reagan, Prime Minister Thatcher, Pope John Paul, and Solidarity leader Lech Walesa. But Havel gets bonus points for continuing to speak out for liberty long after the USSR was vanquished. Havel remained a player until his death at 75. Gillespie digs up Welch's 2003 Profile in Reason. I'm going to steal his pull quote comparing Havel to George Orwell. Then I'll suggest you can read it to encompass Havel, Orwell, and Orwell's recent biographer Christopher Hitchens. Like Orwell, Havel was a fiction writer whose engagement with the world led him to master the nonfiction political essay. Both men, in self-described sentiment, were of "the left," yet both men infuriated the left with their stinging criticism and ornery independence. Both were haunted by the Death of God, delighted by the idiosyncratic habits of their countrymen, and physically diminished as a direct result of their confrontation with totalitarians (not to mention their love of tobacco). As essentially neurotic men with weak mustaches, both have given generations of normal citizens hope that, with discipline and effort, they too can shake propaganda from everyday language and stand up to the foulest dictatorships. Unlike Orwell, Havel lived long enough to enjoy a robust third act, and his last six months in office demonstrated the same kind of restless, iconoclastic activism that has made him an enemy of ideologues and ally of freedom lovers for nearly five decades. Havel was given many awards in his lifetime, though never the Nobel Prizes (for peace or literature) which he so richly deserved. But notable among his prizes was Germany's prestigious Quadriga Award, which he won in 2009 and then returned earlier this year when Vladimir Putin was named the 2011 recipient. It was that old disgust with hypocrisy again. When he died Sunday at age 75, he knew his legacy lived on with freedom-seeking people around the world, not least the imprisoned signatories of China's Charter 08 who took their inspiration directly from him. Their day of freedom is coming. Christopher Hitchens was one of -- if not the -- last element in the set intersection of journalist and public intellectual. He embraced ideas of the left and offered me the most sincere and rational challenges to my beliefs that I have encountered. He did a great book with The Weekly Standard's Chris Caldwell: Left Hooks, Right Crosses. Each submitted a dozen or so favorite articles or papers which captured or reinforced his beliefs and wrote an introduction. His half of this compilation and his Letters to a Young Contrarian represent the most logical (if still unconvincing) arguments for left wing ideas I have ever encountered. He crossed the road so frequently to become an object of true affection for those on the right. Reading The Long Short War or No One Left lead many to claim him for our side. Jonah Goldberg pens an awesome G-File today, comparing Hitch to Whittaker Chambers. Jonah brushes with claiming Hitchens. If you do not subscribe to Jonah's letter you are mad, but let me know and I will forward this superb column to you. Beyond polemics and his evangelical atheism, his brief biography of Thomas Jefferson, books on Henry Kissinger and Mother Theresa, and Why Orwell Matters deserve a serious place in scholarship. Hitch was a man of reason, a man of western enlightenment, and a man of great intellectual and physical courage. At the suggestion of a Facebook friend, we toasted his Hitchness at 7:00 last night. I don't think he'd appreciate a "requiescat in pace" so Cheers, Hitch! I'm glad you posted a tribute to Hitchens. When I read of his passing I thought it should be done, and also thought I could not do him justice. Your effort proves both points. Once the room quieted and the protesters were locked outside, Christie resumed speaking and offered his thoughts on the Occupy Wall Street movement. "Here's the way I feel about it: They represent an anger in our country that Barack Obama has caused," he said, drawing cheers from the crowd. "He's a typical cynical Chicago... politician who runs for office and promises everything and then comes to office and disappoints, and so their anger is rooted not in me or Mitt Romney, their anger is rooted in the fact that they believed in this hope and change garbage." Christie called them disillusioned and said he "feels bad" for them. "Now they are angry but they're not mature enough to know they should be angry with themselves," he said. The first segment has some extraordinary analysis. Yeah. I need to send him a copy of Deepak Lal's Reviving the Invisible Hand to help him contextualize America's role in a liberal international economic order. But his explanation of limited government, liberty, and coercion are not only awesome, but might reach someone who would not accept them from Sean Hannity. And "America" has what role? Forcing me to pay to protect someone's trade routes that I don't care about? Building a military that, like Britain's navy, goes beyond "protection" and instead is used as an instrument of subjugation? Someone left a comment: "It's great that Penn wants to build a library, but what about the people who don't want to help? Should they still have access to the library that other people paid to build for free? And what happens when everyone sees that they could use﻿ the library for free? Who besides the few really nice people that exist will pay for it. I think Penn like many libertarians discounts the fundamental reality of human greed." Actually, freedom-worshippers are the ONLY ones who understand human greed. We know that people abuse "free," and we know that only property rights allow us to protect our property. If I were rich enough to make a library that I own privately but leave open to the public, I'd have the right to set rules. People must sign up for a tracking system so I know who takes what (and allows for suspension of privileges), people get booted for misuse, and I can shut it down (or start charging membership fees) if it gets too expensive for me. It comes down to this: it's my property and I'll do with it as I will. Perry, you can certainly disagree with the "American Experiment" of constitutionally limited government in preference for anarcho capitalism (& I know you do). My suggestion is that Jillette puts it out very forthrightly and clearly, which is becoming all too rare. What Milton Friedman might say to the Occupy movement Two awesome clips at Mankiw's site. Can you imagine either of the serious contenders for the Republican Presidential nomination giving so thoughtful a speech? Does either have any clear idea of what needs to be done? It has long been my judgment that Barack Obama's Presidency could be saved only by the Republicans. Those in the House and the Senate have done splendidly in this particular -- far better than I expected. But the Presidential field is still weak. There is nothing in Romney's background to make one confident that he fully shares Ryan's sentiments. Perry may well agree with Ryan, but he has not yet displayed a genuine capacity for making the argument. A good President need not be a wonk. He or she should have a sound fundamental philosophy and be an excellent communicator and leader. If there's anyone on NED's green earth who should be delegating it is the President of the United States. That said, I find my interest in the former Speaker to be seriously re-piqued after viewing the last 3 televised debates. It seems I'm not alone. Speaker Gingrich was incredibly strong in the debates. Perhaps, in an imperfect field, his imperfections need be reevaluated. Ethanol? Really? I made the argument myself that Chairman Ryan was too wonkish for the job (though I would discard that in a second were he to run), but Rahe is correct that the current crop has difficulty articulating liberty positions. He seems to dismiss Bachmann out-of-hand. Who said logic is dead in popular culture? It's alive and well and leading weak minds astray by the millions. That productive capacity, Coolidge knew, was sapped by the spendthrift--he called it "socialistic"--notions of government that sought to be all things to all people. Coolidge, making note of federal farm subsidies and flood insurance, criticized the thinking of "expect[ing] the government in some miraculous way to save us from the consequences of our own acts," in a post-presidential column on Oct. 17, 1930. Americans, he wrote, "want the right to run our own business, fix our own wages and prices, and spend our own money, but if depression and unemployment result we look to government for a remedy." As Coolidge saw things in 1924, "A government which lays taxes on the people not required by urgent public necessity and sound public policy is not a protector of liberty, but an instrument of tyranny. It condemns the citizen to servitude." Coolidge helped Americans prosper by letting them be free. Any descriptions given for "urgent public necessity" or "sound public policy?" Every single Democrat, Socialist or RINO believes he is advancing both of those causes with his spendthrift, socialistic policies. Not just a Hoss, but a Top Ten Hoss. A great man would not try to score cheap debate points on a memorial post celebrating one of the planet's greatest thinkers. As Captain Mal would say, "I'm allright." Mister Friedman opposed Balanced Budget Amendments. "Friedman was in favor of fixing a percentage of GDP that federal government is allowed to spend." But the GOP BBAs all include this spending limit as a central feature. "Real" MSNBC video here, without the happy endings. I try to hold back the tears that this man demurred on a presidential run in 2012. At least a dozen states ended fiscal 2011 with surpluses. Indiana reported one of the largest, with an extra $1.2 billion in its accounts. Gov. Mitch Daniels, a Republican, on Friday authorized bonus payments of up to $1,000 for state employees. An employee who "meets expectations" will get $500, those who "exceed expectations" will receive $750 and "outstanding workers" will see an extra $1,000 in their August paychecks. "No state anywhere comes close to Indiana's record of spending tax dollars carefully, with total savings over the last six years in the billions. Your spending efficiency has enabled us to stay in the black even as revenues plummeted," said Mr. Daniels, who recently flirted with a run for the White House but ultimately stayed out of the race. The tea party/talk-radio expectations for what Republicans can accomplish over the debt-limit showdown have always been unrealistic. As former Senator Phil Gramm once told us, never take a hostage you're not prepared to shoot. Republicans aren't prepared to stop a debt-limit increase because the political costs are unbearable. Republicans might have played this game better, but the truth is that Mr. Obama has more cards to play. The WSJ Ed Page is suitably pessimistic today. And why not? The Administration is playing for keeps. They'll starve granny to win an election (I would too, that was not a moral reproach) and we should never forget that a compliant media will help them pin the blame on the GOP. If you're in a segue mood, Insty links to a Fiscal Times piece that assures the President that he has overplayed his hand. President Obama has run into a brick wall. It's called the will of the people. The reason he can't force Republicans to raise the debt ceiling is that he will not countenance a deal that cuts spending but doesn't raise taxes. He seems unable to grasp that 236 Republicans in the House of Representatives and 41 Senators have signed the Taxpayer Protection Pledge, promising that they will "oppose any and all efforts to increase the marginal income tax rates for individuals and /or businesses...and oppose any net reduction or elimination of deductions and credits, unless matched dollar for dollar by further reducing tax rates." I'm taking the pessimists' side today. The forces of goodness and light do not have the power. I am resigned to the reality that the debt ceiling will rise, but I'm still confident there will be no tax rate hikes. You see, that titanium spine I credited Sen. McConnell with four posts down was premature. McConnell has proposed a "last-choice" "fallback" solution to the impasse: Give the President authority to raise the credit limit all by himself, limiting the increases to force multiple embarassing votes. The proposal would force Democrats to cast multiple votes to raise the debt ceiling before the next election, while giving Republicans the chance to vote against that without risking a default. And calling the President's bluff on spending cuts by requiring him to present a list of spending cuts he would support that is equal in size to the borrowing limit hike. "If he presents a phony plan, the world can see and we go into the 2012 election and deal with those Democratic senators and president who didn't take this seriously," said Grover Norquist. Click through for context on the famous, colorful contretemps between VP Cheney and Senator Pat Leahy. Four more years of socialism. The GOP might take the Senate, but the blog optimist is officially giving up. UPDATE: I'm adding the "Hoss" category to this post. A guy who could say no to protect his daughters is -- sadly -- the exact kind of guy we need. Deepest condolences, brother. I think he had the right ideas but I wasn't confident he could win in the tee vee age. In a whistlestop campaign he'd have been a world-beater. Too bad he's apparently still fond of medium-big government. Guess I'm in the Cain camp. I did not expect this. There are a few things Gov. Moisturizer could say, but one he will. The WSJ gang on TV yesterday pointed out that his career as a flip flopper make it especially difficult . I believe all of us supported Mitt in '08. I know I did, and I know he won the CO primary. What's changed? The TEA Party exists now, and Obamacare exists now, but Romneycare was a proven failure even then. I understand my friend and blog brother JohnGalt will be caucusing for Governor Romney tomorrow and I will make one more play for his vote -- this time for Senator McCain. The Post-Clinton (That would be President William J, not his wife) GOP Wave produced some colorful characters. But I am wondering how many of them have reached potential. Speakers Livingstone and Hastert leave a tarnished legacy. Speaker Gingrich's calamitous first weeks as a 2012 candidate do not inspire with the vigor of '94. John Kasich has a good gig as Governor of Ohio. I still think of him highly but wince at his 2000 Presidential run. I was supportting him strongly and he went on at great length in a debate about the importance of the Federal Government placing the Ten Commandments in every Public School classroom. Ow, that still stings. I am going to suggest Leader Richard Armey as The Hoss of the Class of 1994. Some of his lobbying work did not go down well with the cognoscenti, but a fella has to eat, and the First Amendment is clear on our right to petition the Government. Instead of throwing grandma off a cliff, we are trying to save grandma's Medicare. The case for reform has gotten stronger since 1995. Spending, borrowing and debt are all far greater problems now. Global bond markets are now openly skeptical of Washington's ability to pay its creditors, as evidenced by Standard & Poor's recent downgrade of U.S. debt from "stable" to "negative." Such a downgrade would make higher borrowing costs and a painful fiscal restructuring likely, unless large spending reductions are enacted soon. We go into this fight on much better ground than 16 years ago. There was no tea party then. A recent Wall Street Journal/NBC News poll found that three-fifths of Americans want a balanced budget. And according to a recent FreedomWorks poll, conducted by Luntz Global, 78% of swing-state voters think "no spending should be off-limits," while 88% believe entitlement reform is "urgent and necessary." Mr. Ryan has bravely started a debate the country needs, putting forth a proposal that fiscally conservative, limited-government reformers can strongly support. If we could improve on his plan in just one respect, it would be to give seniors still more choice and control. I'll second that emotion, Smokey. I cannot imagine supporting a status quo Republican in 2012. I mentioned the "spectacular 'Free to Choose' episode, 'Created Equal." Said episode is number five in the series and while I recommend the whole thing (which appears to be posted on YouTube in six parts) I will highlight part 5, with some excellent exchanges between his Hossness and a young Thomas Sowell in the red corner and Frances Fox Piven (of Cloward and Piven infamy), British Ambassador Peter Jay, and moderator Robert MacKenzie in the blue corner. FRIEDMAN: __ I want to carry it back to an earlier point. Number one, there's no question but what equality of results, if it comes about through a framework of freedom, is a desirable result. Number two, I argue in the film I've argued here that in point of fact you get greater equality of actual results by a system under which people are free to achieve unequal results. That for the poor people of the world that Frances Fox Piven was talking about, the most effective mechanism for enabling them to improve their status is not a governmental program which seeks to ascribe to them certain positions which seeks to provide them with certain goods and services, but a governmental program which tries to eliminate arbitrary barriers to advancement. I would say that in this world the greatest source of inequality has been special privileges granted by government. "Because if I were wrong, if freedom led to wider inequality, I would prefer that to a world in which I got artificial equality at the expense of freedom. My objective, my god, if you want, is freedom. The freedom of human beings and the individuals to pursue their own values." Hat-tip: Ed Driscoll, who quotes Atlas Shrugged's Dr, Hendricks "Let them discover the kind of doctors that their system will now produce." I keep seeing this quote as if it's a bad thing....but I think it's perfect. What else would you call it? "Forced labor", "slavery", tomayto, tomahto. The video was posted by Think Progress -- I suspect they did not file it under "Hoss..."
Unless we have a right to an iPad2 (at least 64GB, 3G), I don't see that the doctor, nurse, technician, and janitor (loved that) must provide their services on demand while the engineer can barter for his. Awesome on stilts, Senator! I'm not jealous of a lot of things. But last year, a friend of mine casually mentioned that GMU Economist Russ Roberts was his good friend and had been his MBA faculty advisor. Here is is hip hoppin' with The Jacket. Governor Mitch Daniels delivers a serious fact and policy filled talk to the AEI on education. His style differs from the big man in the Garden State, but he matches him in seriousness, moral clarity -- and is deeper into a demonstration of his programs' efficacies. I apologize for the many links to long videos this week. I know they are not conducive to work, but I am nursing a bad cold. The first half hour is his speech, if anybody has a chance, the remainder of the 50 minutes is Q&A. And no, he's not Mister Charisma, but the self-effacing, plainspoken Hoosier might look pretty good in contrast to an incumbent of far more style than substance. My thoughts turn to Silent Cal when Gov. Daniels speaks -- he could be our generation's Coolidge, right when he is most needed. As threatened, I pulled the plug on "Digital Preferred," the COMCAST package that includes FOX Business Channel. Eighteen dollars a month, and all I ever watched was Stossel. Investigating alternatives, it looks like his shows make it over to Hulu about three weeks after they air. Even better, his new website provides copious clips. Three long segments from his special on Ron Paul (R- TX) are viewable here. I still cannot join Rep Paul on monetary policy, and I do not happen to subscribe to his principled stance on "World Policing." But what a breath of air. The segment I linked, the 10% solution, includes a Chris Matthews/David Corn (~1:10) segment ridiculing him and his refreshing response. Even if I don't accept them all, the world clearly needs to come a lot closer to Paul's positions. And I just got his book on Kindle --- who knows, maybe he'll get me in the end. Don't forget the "Hoss" category! An oversight. ThreeSources apologizes for the error. Fear of the senior vote has already chased off Profile-in-Courage Susan Collins (Incumbent - ME) and some mid-lights are looking nervous. But a guy who has to win statewide in Arizona is standing tall. One member who isn't backing away is Rep. Jeff Flake of Arizona, who is running for Senate next year. In an interview, Mr. Flake says that he plans to go to Sun City and other retirement areas in Arizona to explain the fiscal necessity of the GOP cutbacks. "I think we need to reassure seniors on Medicare that this plan impacts future retirees, not them," he tells me. He also says that Republicans have to do a better job reminding seniors that "Medicare is going broke if we stick with the current system." That last point was made repeatedly by Marco Rubio in his dressing-down of David Gregory. The GOP young guns statesmen seem to have a clue. Note: HTML tag "strike, /strike" was included around the word "guns" in the prior comment. Apparently that one doesn't work in the comments. We've been seeing a lot more of these lately, so I made it a category. I don't watch 'Meet the dePressed' but my old-school father does. If he didn't, I'd never have seen the following exchange. Dad's email included this editorial message: "I saw Marco Rubio on Meet the Press. He chewed up David Gregory and spit him out." I won't excerpt because much of the slapdown amounts to Rubio rejecting Gregory's premises. It really needs to be watched rather than read. Gregory was changing his map with every question and Rubio did not miss a beat. "I'm more interested in the issues that are happening back here on planet earth." This guy should be on every week. On a side note, I should give props to blog friend and all around hoss Sugarchuck, from whom I stole the term "Hoss."